This granola is the absolute bee's knees. I've had a bit of a complex about making this granola since I nearly burnt my house down last year in an attempt to make it...(I had the oven on grill by accident...with the door shut, MASSIVE freak out was had). I'm lucky both myself and the oven are still alive to tell the tale. The baking tray however is not. RIP. Anyway, I feel like a cat that's got the cream, I've definitely found my weekday breakfast item to surpass all other breakfast items and I'm SUPER excited to share it with you all so you can bask in healthy oat-y, banana-y glee as well. ZERO refined sugars in this recipe only natural sugars, so you can plonk yourself down with a smug smile plastered to your chops whilst tucking into a bowl. The best thing about this granola is that a little definitely goes a long way. I have about a handful for breakfast each morning and it keeps me going through until lunch, (I'm usually a massive grazer). It took no time at all to throw together and I would say I've made enough to last me about 2 weeks. That is unless William snaffles some...which he has been. Grr. Preheat oven to 200 degrees C (fan not grill!!) and line a baking tray with greaseproof paper. Into a large mixing bowl pour your oats, seeds, dried fruits and salt. In a separate bowl, mush up your bananas and stir in your coconut oil, honey and vanilla. Combine well. Pour your banana mixture over your oat-y/seedy mixture and combine thoroughly. Pour onto your lined baking tray and bake for 10 minutes. Toss & turn granola with a wooden spoon and bake for a further 20 minutes, turning the granola every 5 minutes so it doesn't burn on top. Happy weekends one and all! If you likey what you see, follow me on Instagram, Twitter and Facebook for more antics and recipes. I've never baked brownies before that weren't from a packet. I know. BUT yesterday was the magical day when I found out what I've been missing all these years. These brownies were...(big statement blooming)...out of this FREAKING WORLD. Melt in the mouth, moist, packed full of chocolate with a smooth undercurrent of vanilla beer and a drizzle of milk choccie on top for good measure (and because I'm a piglet). I must say, if you have a chance to try any Little Pod products then you're in for a treat, the shortbread was to die for. It ALMOST left me with no room for brownies. Almost. Preheat oven to 180 degrees C fan. Line a 8 x 8 or 9 x 9 baking dish. Using a bain marie/double boiler, melt your chocolate and butter together and stir. Into a large bowl pour your chocolate mixture, sugars and vanilla beer and mix well. Whisk in the eggs firstly before adding your dry ingredients and stirring well until the mixture is as smooth as possible. Pour the mixture into your lined baking dish and bake for approximately 40 minutes, (5 ish mins longer if your dish is 8 x 8). Check the bake with a skewer to see if it comes out clean. Leave brownies to cool on a wire rack (if you can, it was so tempting at this point to face plant them) and drizzle melted chocolate on top when cooled. I strongly advise you bake a batch immediately and dunk them in a glass of milk. (This is precisely what I'm doing right now). Ps, This is not a sponsored post, Little Pod just kindly sent me these products out of the kindness of their hearts. What dreamboats. I LOVE a fete. I really don't think there's anything better than supping Pimms, tasting food from all over the globe, breathing in that smokey sausage and cooked onion smell and getting your face painted. 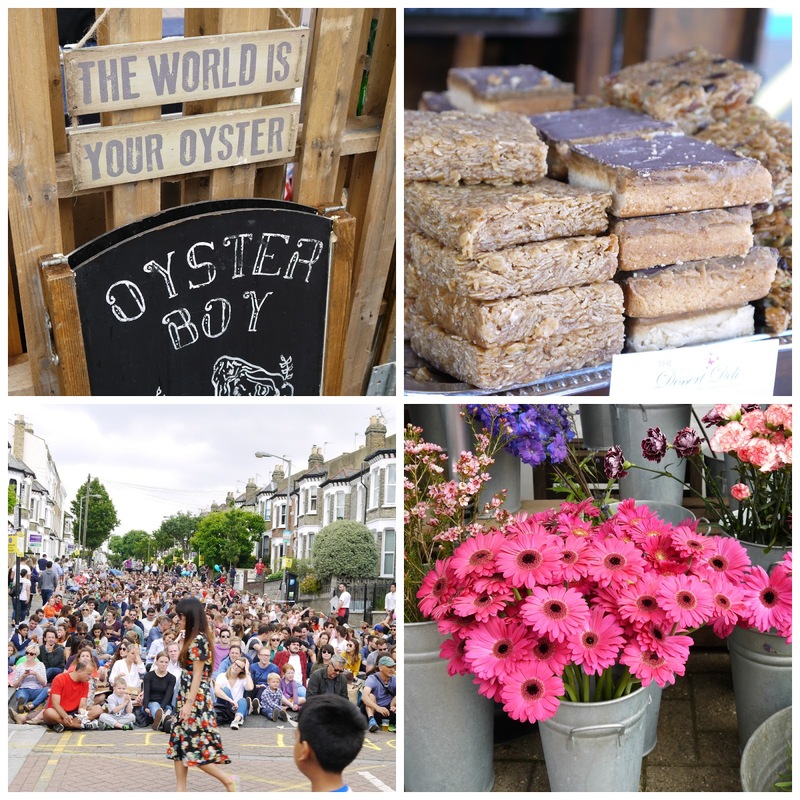 The last time I went to a Summer fete must have been when I lived at home with my parents in Somerset and it was our teeny weeny village's annual church fete crammed full of local families, pooches, tombolas and brick a brac stalls galore! Those were the days. So you can imagine my excitement when my friend told me about Northcote Road Summer Fete on this GLORIOUS Sunday afternoon! I had the loveliest time burning my shoulders, slurping mango lassi, tasting various brownies/blondies, vegan shampoo(!) and having a ruddy good catch up with my god sister. About 5 minutes after taking this picture the sun was BEAMING! Wimbledon fans out on mass! This was amazing, these guys were stripping sugar cane to chew and make into energy balls/drinks etc. This was my favourite item. The wooden Pinocchio doll. He looked so somber and in need of a home. Someone in my life needs to start making babies very soon. I need to buy these things for them! Such a lovely afternoon mooching around. Thank the lord Ourania fed me brunch before we went otherwise I would have come back as big as a house. Thanks Northcote Road, see you again next year.